Watch sample video clips from the DVD such as this clip on How to Speak to a Person with Dementia. For a complete list of brief clips from Accepting the Challenge, go here. Offering comprehensive dementia training, this DVD will help professional and frontline caregivers better understand the behaviors and symptoms of people with dementia while building or improving their caregiving skills. A master training team consisting of an occupational therapist and nurse practitioner introduces a powerfully effective new way of thinking about and caring for older adults with Alzheimer’s disease and related dementias. The focus is on teaching state-of-the-art quality care that provides the highest quality of life for long-term care residents. The DVD also features review capabilities for specific segments within each module and a testing section that allows learners to demonstrate proficiency and receive continuing education credits for dementia-specific training. 2004 Freddie Award Winner (International Health & Medical Media Awards), 2004 Surgeon General’s Award Winner (International Health & Medical Media Awards), and 2004 Bronze Telly Award Winner. 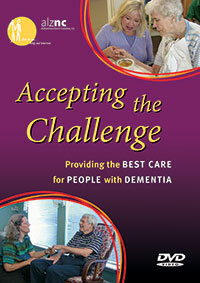 This valuable training DVD was produced by Alzheimer’s North Carolina, Inc. Distributed exclusively for Alzheimer’s North Carolina, Inc.
Teepa Snow is a licensed occupational therapist with 23 years of practice and teaching experience in geriatric settings, including home health agencies, assisted living facilities, hospitals, nursing homes, and rehabilitation centers. Melanie Bunn is a nurse practitioner who has worked in geriatrics since 1983 in hospitals and long-term care facilities. Both are involved with program development and education for the Eastern North Carolina Chapter of the Alzheimer’s Association.